Published in Rafu Shimpo, September 14, 1968, English and Japanese sections. 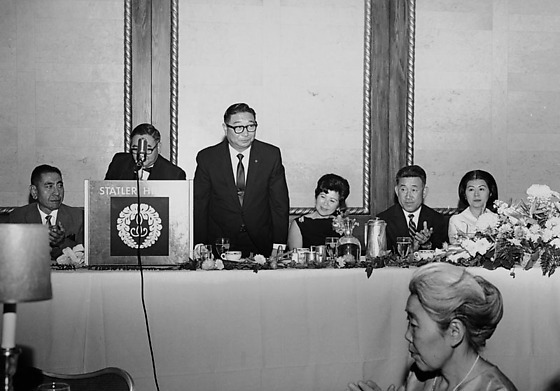 Dinner party for Bishop Kenryu Takashi Tsuji, newly appointed Head of the Buddhist Churches of America (BCA), held at the Statler-Hilton hotel in Los Angeles, California, September 13, 1968. 1P and 2N: Bishop Tsuji standing at head table in suit and black-rimmed eyeglasses. George Yamaguchi stands behind microphone at podium with Buddhist emblem at left. Sakaye Tsuji, wife of the Bishop, wears a corsage and sits directly next to Tsuji with Tosh Terazawa and his wife at right. Older white-haired woman claps in foreground. 3N: Tosh Terazawa presents a certificate of official greetings from Los Angeles Mayor Sam Yorty to Bishop Tsuji, who has his eyes closed. The Bishop's wife, Sakaye, in dark dress and large orchid corsage stands at right. Typed on original envelope: Party for Bishop Tsuji. Bishop Kenryu Takashi Tsuji, Canadian born, was the first Nisei to serve as Bishop (Socho) of the Buddhist Churches of America (BCA) and was elected in 1968. He later founded the Ekoji Buddhist Temple in the greater Washington, D.C. area in 1981.